Two new condominium launch over the weekend saw 40 per cent conversation rate. The 215-unit Mayfair Gardens and the 428-unit The Jovell are the new condominium launches which saw healthy sales considering the latest property curbs. 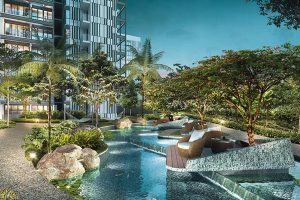 Mayfair Gardens, an exciting new condominium launch by the award-winning developer Oxley Holdings, is set to open for preview this weekend (15-16 Sep). Located in 2 Riffle Range Road, District 21, the site (formerly known as Mayfair Gardens) was acquired at a whopping $311 million plus an additional $52 million as lease top-up premium for a fresh 99 years. The fact that the condo development is located in close proximity to schools and transport as well as shopping amenities makes it highly attractive to tenants and investors alike. At the close of balloting on Sept 29, 81 units were sold at Mayfair Gardens which means that 37.7 per cent of the development were sold on the first day of new condominium launch. About 200 cheques were collected by marketing agents as expressions of interest at Mayfair Gardens, which adds to a conversion rate of 40 per cent. Meanwhile the new condo launch at The Jovell saw an an estimated 100 cheques were collected as expressions of interest. Based on the 40 units sold over the weekend, it reflects a conversion rate of 40 per cent. As a percentage of total units in the project, The Jovell sold about 9.3 per cent of the 428 units at the development. The Jovell, a condominium development by Tripartite Developers Pte Ltd located along Flora Drive, will open its showflat for preview this Saturday (15 Sep). The Jovell is located in a quiet and scenic private enclave in District 17. The new condominium launch sits on a staggering 330,225 sqft piece of land, which is on a 99-year leasehold, and is expected to accommodate 9 blocks towering 8 storeys up. Prices at The Jovell is estimated to range between S$1000 and S$1200 per square feet (psf). This price estimation was arrived at after careful consideration of the location of the new condominium launch, the value of the land and the average unit sizes at the development.